BACKGROUND AND PURPOSE: In MS, the total brain lesion volume and spatial distribution of lesions across the brain vary widely among individual patients. We hypothesized that spatial distribution may be partially driven by genetic predisposition, and we aimed to explore relations among candidate genes and the spatial distribution of white matter brain lesions in MS.
MATERIAL AND METHODS: Genotypes of 69 SNPs in 208 patients with MS were related to the spatial distribution of T2 brain lesions. Lesions were manually outlined on MR images, and binary lesion masks were produced and registered to a common space. With Randomise software, the lesion masks were related to genotype by using a voxelwise nonparametric GLM approach, followed by clusterwise analysis. We used a DNA chip with SNPs selected from the literature on MS susceptibility, severity, and phenotypes. RESULTS: For 11 of these SNPs, 1 of the genotypes expressed significant clusters of increased or decreased lesion probability in varying, predominantly periventricular, brain regions. When we statistically controlled the voxelwise analyses for effects of total brain lesion volume, only 1 SNP remained significant: rs2227139, located within the MHC class II region. This SNP retained its periventricular cluster of significantly increased lesion probability for the heterozygote genotype. CONCLUSIONS: Heterozygosity of rs2227139 (MHC class II region) is associated with increased right frontal periventricular lesion probability (P < .01). Ten other SNPs showed associations between genotype and spatial lesion distribution that are partly explained by total lesion volume. We suspect a genetic influence on the anatomic distribution of MS lesions for 3 main reasons: First, studies confirm a tendency of patients to develop relapses in the same locations.19,20 Moreover, in relatives who have MS, lesions have been observed more frequently in similar locations.14 This tendency for localized exacerbations could be genetically predetermined. Second, in EAE (the animal model used to study MS), involvement of a genetic factor was already demonstrated in lesion distribution. Butterfield et al21 showed that in mice EAE, the lesions in the spinal cord and brain were controlled by different quantitative trait loci. Third, recently we found that carriership of HLA-DRB1*1501 is associated with more lesions within the spinal cord, but not with the total lesion volume in the brain.22 This allele, also known to be involved in MS susceptibility, is hence suggested to specifically affect lesion development in the spinal cord, a particular region of the central nervous system. Similarly, lesion development in certain regions inside the brain may be partially dependent on genetic parameters. A recent study found that the HLA-DRB1*1501 allele did not have an effect on lesion distribution.23 We hypothesized that an effect on lesion distribution may be even more likely for genes associated with disease phenotype. To explore this hypothesis, the present study compared spatial lesion distribution on MR imaging between different genotypes of a set of genes selected on the basis of their potential contribution to phenotypes of MS in a large cohort of patients with MS, by using LPM. This cross-sectional study used clinical and genetic data and MR images of 208 white patients sampled from MS natural history studies at our center. Patients were included on the basis of availability of brain MR imaging and DNA material. The selected patients are a subgroup of those in whom the clinical correlates of brain lesion distribution were studied previously.7 All had a diagnosis of MS according to the Poser criteria,24 McDonald criteria,25 or revised McDonald criteria,26 depending on the date of data acquisition. EDSS27 scores were obtained within a median interval of 0.0 (IQR, 0.0–4.8) months from MR imaging. Approval by the local ethics review board was obtained, and all participants gave informed consent. PubMed (http://www.ncbi.nlm.nih.gov/sites/entrez) and Genetic Association (http://geneticassociationdb.nih.gov) data bases were searched for genes and polymorphisms with suggested involvement in pathogenesis, prognosis, and treatment response in MS. Resulting polymorphisms were confirmed and associated with an identifier by using the dbSNP data base (www.ncbi.nlm.nih.gov/SNP). Their frequency in the white population was assessed by using the HapMap project (http://www.hapmap.org/index.html.en). Nucleotide sequences for the design of allele-specific probes and polymerase chain reaction primers were retrieved in the SNPper data base (http://snpper.chip.org/bio). Sequence-specific probes and primers were designed by using Primer3 software (available free at http://frodo.wi.mit.edu). If a polymorphism was not present in the data base, position and sequences were established by performing a blast search (http://blast.ncbi.nlm.nih.gov/Blast.cgi) by using data available in the literature. SNPs within the MHC class II region were predominantly selected on the basis of the described linkage disequilibrium with the HLA-DRB1*1501 allele.28,29 All genetic data bases were accessed in 2006. The SNP rs numbers and gene symbols were actualized on February 9, 2009. A total of 80 validated polymorphisms located in 44 different genes were finally chosen (On-line Table). We excluded 11 of these 80 SNPs: 5 because they were monomorphic and 6 because they had a minor allele frequency below 5%. Deviations from Hardy-Weinberg equilibrium were determined by χ2 testing. Different image-acquisition protocols were used for the various clinical studies from which our patients were sampled. We used 2D conventional or fast spin-echo proton-attenuation and T2-weighted images, acquired by using either 1T Magnetom Impact (77.4% of patients) or 1.5T Magnetom Vision (Siemens, Erlangen, Germany) (22.6%) scanners by using standard head coils, with section thicknesses of 3–5 mm, in-plane resolution of 1 × 1 mm2, and a maximum intersection gap of 0.5 mm. On these images, lesions were identified by an expert reader and then were outlined by using home-developed semiautomated seed-growing software (Show Images)31 based on a local thresholding technique, thus creating binary lesion masks. T2-weighted images were created from each patient's T2-weighted image by using Brain Extraction Tool (FSL).32 We created a common-space T2 template with 2 × 2 × 2 mm voxels by linearly registering all T2 brain images (allowing 12 degrees of freedom) to the International Consortium for Brain Mapping(Montreal Neurological Institute-152) brain image,33 by using the registration tool FLIRT (part of FSL, FMRIB Analysis Group, University of Oxford; http://www.fmrib.ox.ac.uk),34 followed by averaging and smoothing by using a 4-mm full width at half maximum Gaussian kernel. To bring all lesion masks to this common space template, we then registered all individual T2 brain images to the common space T2 brain template (again by using FLIRT with 12 degrees of freedom), and we then applied the registration matrices thus obtained to the corresponding binary lesion masks. Nearest-neighbor interpolation was used to generate individual lesion maps that showed lesion presence or absence for each voxel. Registration quality was ensured by visual inspection. To investigate the effect of the global whole-brain lesion load, we calculated total brain lesion volume. To account for head size differences, we calculated lesion volumes in common space after registration (therefore representing relative lesion volumes). Voxel- and clusterwise statistical inference was accomplished by using the nonparametric Randomise method as implemented in FSL 4.0 (FMRIB Analysis Group), by using a GLM design to model each voxel independently from the other voxels (5000 permutations; cluster-forming threshold pseudo-t = 2, corresponding to voxelwise P-threshold = 0.01).34,35 For each SNP, we made 3 comparisons to test the association of genotypes with voxelwise lesion probability, always comparing 1 genotype with the combination of both other genotypes (ie, the comparisons made were the following: homozygote frequent allele versus heterozygote and other homozygote; homozygote rare allele versus heterozygote and other homozygote; and heterozygote versus both homozygotes). The lesion masks of the patients carrying a certain genotype were put together and compared with the lesion masks of patients who did not carry this genotype. For each comparison, we separately tested for both increased and decreased lesion probability associated with that genotype. Although SNP markers with low genotype frequencies may be of importance in complex trait disorders like MS, such markers can result in unreliable observations in voxelwise analyses. Therefore, homozygote genotypes with frequencies below 5% in our cohort were combined with the heterozygote genotype and compared with the other homozygote genotype. Because total brain lesion volume has been found to influence lesion distribution,7 we took the following 2 steps: First, for genotypes showing significant clusters in the LPM analyses, these LPM analyses were repeated while statistically controlling for total brain lesion volume. Second, we investigated the effect of genotype on the total brain lesion volume at a patient level by directly comparing the total brain lesion volume among genotypes, while statistically controlling for disease duration (without taking anatomic distribution into account). Finally, for the LPM and total brain lesion volume analyses, we tested whether correction for disease duration affected the results by using GLM (after log-transformation of the total lesion volume to obtain a normal distribution). Our cohort of 208 patients with MS was representative of the general MS population regarding patient characteristics (Table 1), with a slightly high proportion of patients with primary progressive MS (19.2%). 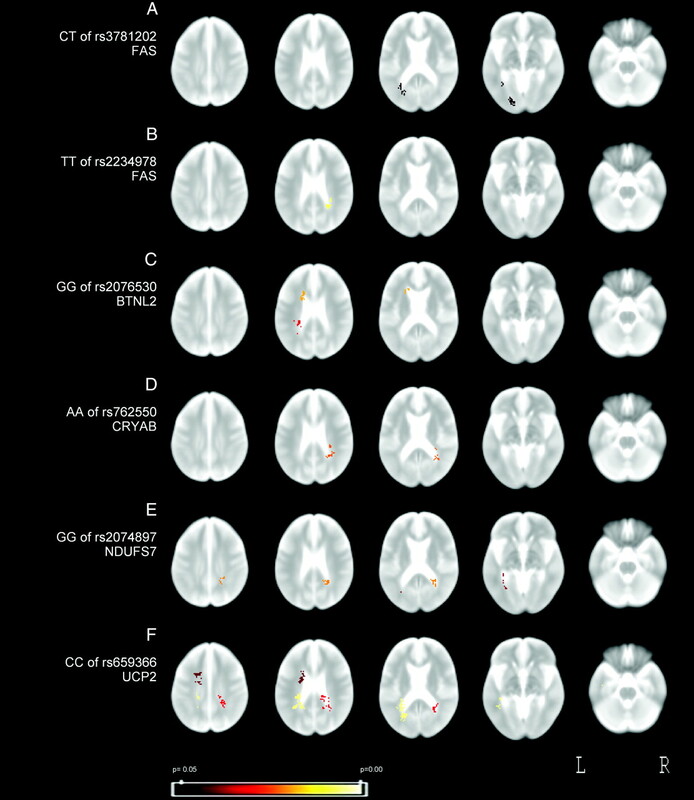 These patients had a quasisymmetric brain lesion distribution typical for MS (Fig 1), with the highest lesion frequencies in the periventricular regions. 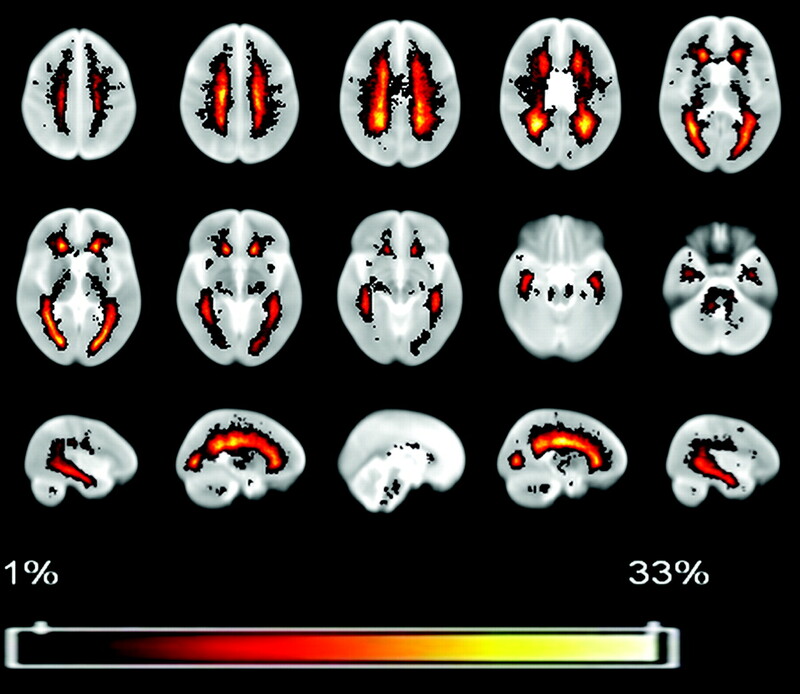 Lesion-frequency map for our group of 208 patients with MS, indicating, for every voxel, the lesion frequency throughout our patient sample, showing a range from 1% (n = 2 patients having a lesion in that voxel) through the maximum of 33% (n = 69). Of the 69 SNPs analyzed, 11 genotypes of 10 SNPs showed significant clusters of either increased or decreased lesion probability, predominantly in periventricular clusters, for 1 of the genotypes (Figs 2 and 3 ). All clusters were located periventricularly, abutting the frontal or occipital horn of the lateral ventricles, often in an asymmetric configuration. Association between increased lesion probability and genotype. Each row shows results for the comparison of 1 genotype with the other 2. A, CC genotype of rs2107538 within the CCL5 gene. B, AA genotype of rs9808753 within IFNGR2 gene. C, AG genotype of rs2076530 within BTNL2 (MHC class II associated). D, AG genotype of rs876493 (within PNMT). E, CT genotype of rs2227139 (within the MHC class II region). F, CT genotype of rs2227139 (within the MHC class II region), when statistically controlled for total T2 brain lesion volume. Images show several axial sections of the T2-weighted template (the same sections in each case), with color overlay (indicating P values) of the clusters in which local lesion probability was significantly increased. Association between decreased lesion probability and genotype. Each row shows the results for the comparison of 1 genotype with the other 2. A, CT genotype of rs3781202 (within FAS). B, TT genotype of rs2234978 (within FAS). C, GG genotype of rs2076530 within BTNL2 (MHC class II associated). D, AA genotype of rs762550 within CRYAB. E, GG genotype of rs2074897 within NDUFS7. F, CC genotype of rs659366 within UCP2. Images show several axial sections of the T2-weighted template (the same sections in each case), with color overlay of the clusters in which local lesion probability was significantly decreased. An increased lesion probability, in different periventricular regions, was observed for the heterozygous genotype of 3 SNPs: rs2227139 (within the MHC class II region), rs2076530 (within BTNL2), and rs876493 (within PNMT). Furthermore, there were 2 SNPs in which the homozygous major allele was associated with a higher lesion probability—that is, rs2107538 within CCL5 and rs9808753 within IFNGR2 (Fig 2). For 6 SNPs, a genotype was associated with a decreased lesion probability (for details on cluster location and genotypes see Fig 3). These 6 SNPs were located within the following genes: BTNL2 (MHC class II–associated), CRYAB, NDUFS7, UCP2, and 2 SNPs within FAS. When total brain lesion volume was included in the statistical model, only rs2227139 (within the MHC class II region) retained a significant cluster in which the CT genotype was associated with an increased local lesion probability compared with the other 2 genotypes (Fig 2F). This result of rs2227139 also remained after correction for disease duration. To corroborate our findings, we calculated the voxelwise average lesion frequencies for each of the 3 genotypes of the SNP rs2227139, the only SNP that remained significant after controlling for total brain lesion volume. In the voxel with the maximum pseudo-t value observed in the significant cluster (voxelwise pseudo-t = 4.1), a lesion was present in 29% (n = 26/89) of the patients with the heterozygote genotype CT, compared with 16% (n = 12 / 77) of the patients with the CC genotype and 2% (n = 1/42) of the patients with the TT genotype. There were no genotypes of any SNP associated simultaneously with both a decreased lesion probability in 1 location and an increased lesion probability in another, indicating consistency of the observed relations across the brain. We assessed whether genotype was directly related to total brain lesion volume for the SNPs with significant results in the clusterwise analysis. Of the 11 genotypes associated with an increased or decreased lesion probability at the described locations, 6 genotypes were significantly associated with total lesion volume in the brain (Table 2). When we controlled these results for disease duration, 3 SNPs were significantly associated with total lesion volume. The results were consistent with the LPM results—that is, genotypes associated with a higher total brain lesion volume were also associated with an increased local lesion probability and also a decreased local lesion probability. No data are available on the effect of this SNP on region-specific differences in the brain. However, previously, multiple HLA alleles showed effects on several MR imaging severity markers, such as T2 lesion volume, T1 hypointense lesion volume, and atrophy measures,38,39 suggesting a role for several HLA alleles in the MS phenotype. These findings highlight the importance of HLA genes on MR imaging severity markers. Future studies on the genetic influence on lesion location should preferably include high-resolution HLA typing, enabling comparison of the effect of different HLA alleles on lesion distribution (taking possible interaction between genes into account) and detecting the true causative alleles. As can be seen from Figs 2 and 3, the SNPs showed altered lesion probability in predominantly 4 regions: the bilateral periventricular white matter next to the frontal and occipital tip of the horns of the lateral ventricles. The periventricular clusters are distributed in an asymmetric manner. We have no explanation for these asymmetries, which persisted after post hoc repeated analyses with a lower significance threshold. A priori, a genetic influence on this asymmetric distribution is theoretically unlikely. Another study also noted an asymmetric distribution of MS brain lesions at the individual patient level, possibly reflecting a different lineage pattern.9 Although our number of patients is relatively high, bias due to, for example, the high number of patients with progressive MS is possible and cannot be excluded. Rs2076530 within the BTNL2 gene was the only SNP showing significant effects for more than 1 genotype. The AG genotype was associated with an increased lesion probability in the periventricular white matter adjacent to the right occipital horn, while the GG genotype was associated with a decreased lesion probability in the periventricular white matter adjacent to the left occipital and frontal horns. Both effects were nonconflicting and disappeared after correction for total brain lesion volume. The relation between HLA-DRB1*1501 (the MHC class II allele strongly associated with susceptibility to MS)12,40,41 and spatial lesion distribution within the brain was studied in 1 previous report23 demonstrating no significant influence of the allele. Our results (by using rs3135388, a SNP in the MHC region predicting the HLA-DRB1*1501 haplotype with very high sensitivity)28 confirmed, in a larger sample, the negative results of this previous study of Sepulcre et al.23 In a subset of the current patient group, we previously found the HLA-DRB1*1501 allele to be related to increased lesion loads in the spinal cord but not the brain. In the present study on a larger patient group encompassing the former, we confirmed that the HLA-DRB1*1501 allele was not related to the total volume of brain lesions,22 and most important, we added the new finding that it is also unrelated to their anatomic distribution across the brain. Furthermore, the linear registration method used to warp the lesion masks of individual patients to the template, by definition, cannot correct for the variability in ventricular and sulcal sizes that is present in patients with MS as a result of differences in brain atrophy. Therefore, the matching between individual patients' brains will be imperfect; this discrepancy leads to less accurate overlay of corresponding anatomic areas and may explain, to some extent, why we only found clusters in the periventricular region and not in areas with a lower lesion frequency. Despite these limitations, we deliberately chose a linear registration method (FLIRT) because of the difficulties associated with nonlinear registration methods. In this study, we were limited in the sequences available (dual-echo images only); this limitation poses problems for nonlinear registration regarding the distinction between periventricular lesions and ventricular CSF because of their similar signal intensities. Second, nonlinear registration could result in displacement of lesions inside the brain, thereby affecting the very aspect of the disease that we intended to study (namely lesion distribution). The third limitation is the absence of gray matter lesions in our study, because these lesions go mostly undetected when using standard MR imaging techniques.43 From postmortem studies we know that gray matter lesions are extensively present in patients with MS,43 and it can be expected that a different genetic background may influence the lesion distribution between the white and gray matter compartments, as well as the anatomic distribution within the white and gray matter. Total brain lesion volume seems to be an important covariate in LPM analyses.7 Apart from the left frontal horn cluster in rs2227139, no clusters retained significance when the model was controlled for lesion volume. Thus, the influence of genetic background on spatial lesion distribution, as assessed in the current study, may partly act through total brain lesion volume and come to expression in voxelwise analyses, especially in regions with relatively high frequencies of MS lesions, where differences among groups can become statistically significant (ie, the periventricular white matter). Therefore, in future studies, when comparing groups, a correction for total brain lesion volume should be considered. The genes investigated in this study are putatively associated with susceptibility or disease severity in MS, and we hypothesized that the variation in anatomic distribution of brain lesions among patients with MS may be partly genetic in nature. Our results suggest that such a genetic influence may indeed be present. Independent studies should now be conducted to confirm these findings, including studies using alternative methodology in addition to LPM, for example, by using predefined regions of interest defined on the basis of LPM results to increase sensitivity in detecting differences. For the genes with significant results, there are no obvious relationships between their functions and spatial MS lesion distribution. However, several of the SNPs that were significantly associated with lesion distribution were also significantly associated with the total lesion volume in the brain. The previously reported effect of these genes on the overall lesion burden (T2 lesion volume, T1 hypointense lesion volume, or atrophy18,38,44,45), acting through their functions in different processes such as mitochondrial energy metabolism and inflammation, is likely to generate differences in lesion distribution among the genotypes. Our finding that statistically controlling for total brain lesion volume removes the observed effects on lesion distribution suggests that these genes possibly exert an effect mainly on the overall lesion burden. However, to fully address this issue, a more focused approach should be applied, by using both an LPM approach and predefined areas of interest (hereby increasing the statistical power) and by selecting more homogeneous patients to limit the effect of confounding factors. In this context, a longitudinal study on the spatiotemporal development of new lesions (including T1 hypointense lesions and T1 gadolinium-enhancing lesions) would be valuable. Eventually, the insights gained from this approach may yield ways of predicting, from patients' genotypes, whether they are likely to develop lesions in clinically eloquent areas. This exploratory study revealed an association between heterozygosity on rs2227139 in the MHC class II region and preferential periventricular lesion formation in MS. Other SNPs also showed associations between genotype and spatial lesion distribution, which are worth studying in future investigations by using a more focused approach and considering genetic pathways in addition to single genes. In these future studies, the potential role of lesion volume influencing the relation between genotype and lesion distribution should be explored further, as well as the distribution of gray matter lesions, contrast-enhancing lesions, and persistent T1-hypointense lesions. We thank all patients for participating. Both M.H. Sombekke and M.M. Vellinga contributed equally to this work. This work was supported by the Dutch MS Research Foundation through a pilot project grant (grant 05-566). The MS Center Amsterdam is supported by the Dutch MS Research Foundation through a program grant (grants 05-358c and 02-358b). The study was further supported by a corporate sponsor (Progenika Biopharma S.A.), which performed DNA analyses. Design and conduct study, including selection of SNPs for DNA chip, were supported by academics and corporate sponsor jointly. The DNA chip was intellectually protected by the corporate sponsor. Statistical analyses and collection management analysis and interpretation of the data were performed by academics. Preparation, review, and approval of the first draft of the manuscript were performed by academics; the corporate sponsor reviewed and approved the current manuscript. Paper previously presented as a poster at: Annual Meeting of the European Committee for Treatment and Research in Multiple Sclerosis, September 9–12, 2009; Dusseldorf, Germany.
. An extremes of outcome strategy provides evidence that multiple sclerosis severity is determined by alleles at the HLA-DRB1 locus. Proc Natl Acad Sci U S A 2007;104:20896–901.Epub 2007 Dec 17. Accepted after revision September 2, 2010.